Institute for Energy Research and American Energy Alliance president Thomas Pyle recently toured Pennsylvania’s northeast Marcellus Shale, making stops in Williamsport, Tunkhannock and Harrisburg to discuss the game-changer that shale has been for the Commonwealth. 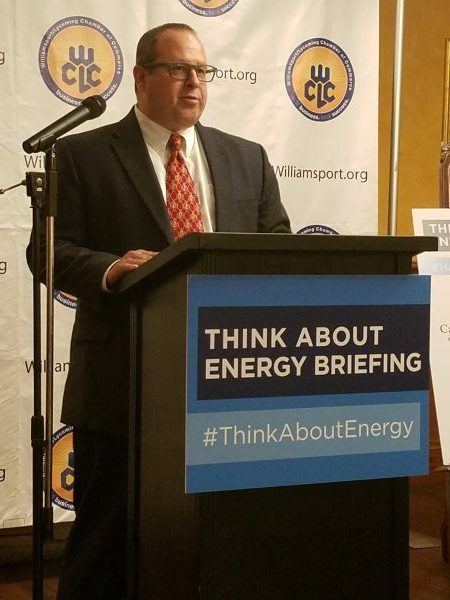 Thomas Pyle speaking at the Williamsport-Lycoming Chamber of Commerce’s Think About Energy Event. Thanks to shale, Pennsylvania has become the second largest U.S. producer of natural gas – going from producing less than 200 billion cubic feet of natural gas annually to more than 5 trillion cubic feet annually in roughly a decade. As Pyle explained, “That’s enough natural gas to provide for U.S. residential gas consumption for an entire year with room to spare,” in addition to providing economic benefits across the Commonwealth. But as Pyle noted, not every state has followed the same path to “energy preeminence” that Pennsylvania has taken. “Pipeline constraints have caused Northeastern states to experience at times the most expensive natural gas prices in the world, with some winter rates in New England increasing to 60 to 70 times the normal rate. And New York could have a similar story to share if it weren’t for the “Keep It In the Ground” agenda taking priority over science and experiences that have led to very real consequences for neighboring New England. To use a baseball analogy that is quite apropos, considering Pyle also had the opportunity last week to throw out one of the opening pitches during Marcellus Energy Night at a Scranton Railriders game: We’re only in the first inning of this shale revolution, and there may still be time for states like New York to get into the game.